Weather in Coonoor remains pleasant throughout the year, making the city an ideal choice for short trips and extended vacations. The picturesque view of the city can be enjoyed in any month. The best time to visit this hill station is between the months of October to march. 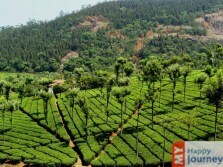 People who love green sceneries and rainfall should visit coonoor in the months of June to September. To relax their mind and body, tourist should visit this city in the month of October to February. This is the best time for people who love the winter season and these months are perfect for different kinds of activities. Any month is perfect to visit this hill station. Newly wedded couples find this hill station as a perfect spot for their honeymoon vacations. There are lots of attractions that usually attract tourists towards it. Some of them are LambÃƒÂ¢Ã¢â€šÂ¬Ã¢â€žÂ¢s Rock, DolphinÃƒÂ¢Ã¢â€šÂ¬Ã¢â€žÂ¢s Nose, and Tiger Hill Cemetery, to name a few. Coonoor is well known for its Nilgiri tea, handmade antiques and Indian handlooms. The shawls that are made by the local artists are famous for their designs. December to February- During winters, the weather is not very cold with the temperature ranging from 10°C to 20°C. This season witnesses heavy rush of tourists because it is regarded as the best time for sightseeing. March to May- During these months visitors can enjoy different outdoor activities. The climate remains pleasant and the temperature remains between 15°C to 25°C around this time. June to September- The months of June to September mark the beginning of monsoons and the city witnesses mild to medium rainfall. Because of the monsoon showers, the atmosphere becomes humid. Moderately Cold Due to high humidity level, caution is advised to the tourists who are more prone to heat disorders. Prolong sun exposure should be avoided as it may cause fatigue. This month is not regarded as the best month to visit coonoor but tourist who loves rain can visit in this month as rain can be observed on any day of this month. Pleasant This month is considered as a good month to visit coonoor. Sky is mostly covered with the clouds. Winds are observed throughout the day. As the level of humidity is high in the atmosphere hence the chances of rainfall or drizzling are high therefore people who do not like rain should avoid going in this month. Moderately hot The temperature has started to rise slowly. Tourists generally do not prefer to visit the city in this month. Outdoor activities are not suggested during this month. With the increase in the temperature and humidity, heatstroke may be possible with prolong exposure with the sun therefore people should remain indoors only. Hot This is also not the preferred month to visit coonoor. Getting involved in outdoor activities is not suggested. Average temperature being 33Ãƒâ€šÃ‚ÂºC makes the weather hot and presence of high humidity only makes it worse. Lot of strong sunshine is observed in this month. Hot winds make the weather more unpleasant and use of sunscreen is recommended. Hot No improvement in the weather is seen in this month. Hot winds blow all day long. People who are comfortable in travelling in heat and high level of humidity can visit this hill station in this month. The fruits and vegetable festival is the main attraction of this month and is one of the famous festivals celebrated in coonoor. Pleasant This month is pleasant for indulging in different types of outdoor activities. Tourist can enjoy special packages during this month. Due to pleasant weather, tourist can even travel to the nearby places. The temperature at night can sometimes drop to 20Ãƒâ€šÃ‚ÂºC hence nights are pleasant. Drizzling is sometimes expected in this month. Pleasant With the start of this month, arrival of monsoon is marked. The hill station receives moderate amount of rainfall. During this time the hill station looks very beautiful and this is regarded as the best season for tourist visit. The beauty of SimÃƒÂ¢Ã¢â€šÂ¬Ã¢â€žÂ¢s park can be enjoyed at its fullest in this month. Pleasant As this month falls in the monsoon season, therefore rains can be expected at anytime of the day. Carrying an umbrella, when going for a walk or for any tourist activities is considered as a good idea. People who love being outdoors but do not prefer much crowd then the month of august is best suited for them for a visit to this hill station. Pleasant The weather remains pleasant throughout the day with cold winds blowing all day long. The night temperature can sometimes drop to 12Ãƒâ€šÃ‚ÂºC, making nights very cold. This is the perfect month to visit the hill station with your partner. The cool weather can infuse new energy in the couples and they can feel recharged. Pleasant Tourist planning their trip to coonoor should plan it in this month. This month is full with different kind of activities for the tourists. With less amount of rainfall or no rainfall this month is best suited for the people who like dry winter season. This is the time of the year when a large number of tourists visit coonoor. Cold The days are warm but the nights are chilling. This is the perfect month for sightseeing. Woolen clothes should be carried along in this season as night temperature can dip to a low sometimes. Children should never be allowed to step outside without winter clothes on. This is the best month to visit coonoor. Cold This is the coldest month of the year. People who are fond of winter season should visit at this time as this will be the best season for them. In this month different indoor and outdoor activities can be enjoyed to their maximum. Tourists who are with their friends can enjoy this month to the fullest. This month is not affected by foggy conditions.